Schofield Printing: What Is A Vector Art File? When providing us with an art file for most screen-printing jobs we will need a vector art file. Vector art is one of the two forms of art used by computers, with the other being bitmap art. Bitmap art is identified with file names ending in .gif, .jpeg, .jpg, and .bmp. Vector art, on the other hand, ends in .ai, .cdr, .eps & .pdf. There are a few more extensions, but these are the most common. All of the images that you see on the Internet are bitmap files, and are not in any way vector artwork. A vector art file is a file that was created in a draw program such as Adobe Illustrator & CorelDraw. In order for the file to be a usable vector art file it would have to be created in one of these programs. You can take a bitmap file and place (import) it into a draw program, but this does not make the file a vector art file. Vector art and bitmap art are different in the way they are stored in the art files. Bitmap art utilizes pixels that are saved in a file as a series of numbers. Pixels create several dots of color in order to create the image. Vector art, on the other hand, saves the image as lines with coordinates of their starting and ending points. This creates simple images, and research has demonstrated that this is the way the human brain sees and stores images. Vector graphics can be resized without any change to the quality of the image. You can make a vector art file as large or as small as you need it to be without compromising the quality of the image. Bitmap art, on the other hand, becomes jagged (pixilated) when enlarged, as the pixels used to create the image are enlarged. 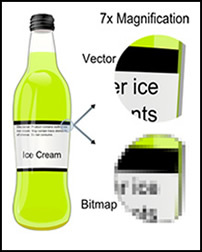 Vector images can easily be converted into bitmap images. 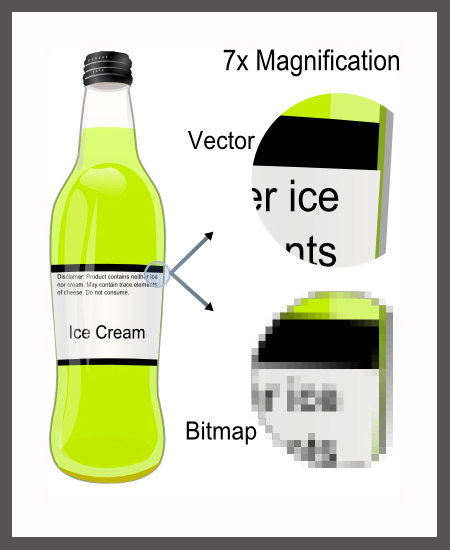 However, there is no "Conversion" process for transforming bitmap files into vector files. To create a vector image from a bitmap file is a difficult process. The image has to be redrawn in a draw program (such as Adobe Illustrator & CorelDraw). There is no easy way around it! The only way to create usable vector artwork from a bitmap image is to recreate it in a draw program. .ai - Adobe Illustrator graphics, .pdf - Portable Document Format & .eps - Encapsulated PostScript. The above graphic was borrowed from Wikipedia.com.